Are you wondering, “Oh my gosh – what did I get myself into?” Well, no need to be asking that question. We are here to put your mind at ease. What do I wear, what equipment do I need, what training is needed, what is race day like? Answers to these and any other questions you may have will be answered. We will have some first time participants tell you what it was like for them on race day too. You will leave feeling good about the journey you are about to be on! There will be three pre on-course swim clinics held at SMCC. 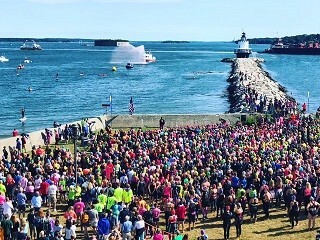 Open water swim expert, and Tri for a Cure Swim Coordinator, Kirsten Reed from sheJAMs & KGR Coaching, will discuss water safety, navigation and provide important swimming tips before sending waves of women into the water for a swim around the course. Trainers, race director, and volunteers will be available following the swim to answer any questions and concerns. These clinics are offered to provide women with the chance to experience an ocean swim with a group, as it will be on race day. This will be a good opportunity to practice with your wetsuit and get comfortable with the cool water temperature. We will have sheJAMs “SWIM ANGELS” available for those who need them. All participants are encouraged to swim open water with your wetsuit several times before race day. The clinics are a way to experience swimming with a group of 100 women in a swim wave. This should not be your only or first time in open water. Please be prepared, swimming in cold open water for race day take practice. We will practice (T1) transition – so bring your running shoes…. Race Director Julie Marchese will present a transition clinic in a classroom setting for Tri for a Cure Individuals and Relay Teams. Participants will learn about transition flow, how to set up a transition station, safety and rules of transition. Ample time will be provided for questions. Clinic will be held for both Individuals & Relays! FIRST TIME INDIVIDUALS AND RELAYS THIS IS A MUST!